It seems that everybody is baking cookies these days. I know it's the Holiday Season but I feel that Americans are baking more cookies during this time of year than during the rest of the year. It's a tradition to offer home-made cookies as a gift for friends here... and I remember that my friend M-A from San Francisco offered me a great box of her home made cookies once. They were delicious. I love shortbread cookies but I am no big fan of sugar cookies, especially if they are coated with icing. Too much fake sugar for me. The other day, because I was in a hurry and wanted to bake with the children as a late-afternoon activity (like just before bath so that they can go straight from the kitchen to the bathtub! ), I purchased a ready-to-make dough from the supermarket. I generally don't purchase them but I thought that for once, I was going to give it a try. We made the dough together (super-easy, no mess!) and my children and I really liked the dough. We cut the cookies and even though the package said that we were going to make 2 dozens of cookies, the dough seems to be infinite. Cutting. Folding again. Rolling. Cutting. Folding again. Rolling. Cutting. At the end, I think that we had about 50 cookies. Much more than we could possibly eat among us... but in a way we were really excited. Then came the HUGE disappointment. Once cooked, these cookies were tasteless. No pleasure when taking a bite. A pure waste of calories! My daughter even made the comment : "mais la pâte était pourtant bonne, maman (but the dough was good, mom"). Yes, I know. Sigh. The brand I used is well known for its flours; so you would think that making a step from flours to cookie dough would be easy for them. Apparently not! As we would say in business school, focus on your core business, i.e. stick with flours... don't mix them in any kind of dough! I hope that this unfortunate experience of mine just made you even more convinced that baking everything from scratch is the way to go! With this bad experience in mind, I decided to bake other cookies with my children. 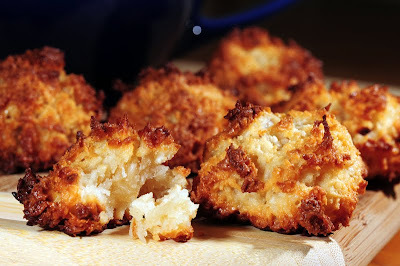 We all love coconut (remember my coconut ice cream) and even though I don't like things too sweet, I do like Coconut Macaroons (Rochers Coco as we call them in French). Since we were going to get together with a friend whose son is allergic to wheat, I decided to make a gluten-free recipe so that he could ate some with my children all of us. I prepared the dough in advance but you could go straight from the pot to the cooking sheet if you were in a hurry. The children helped me shape the macaroons. They were in heaven: it was like playing with an eatable play dough, and a good one of that matter! The macaroons were delicious and the best part is that they age very well. They taste even better a day or two after you baked them. And they are (almost) healthy: no egg yolks (for the cholesterol-concerns), no wheat (for the gluten-free), no butter (for the calories-intake-counters)...but, yes, very sugary. But when it's well below zero outside with 20 inches of snow to shovel, sugar your body needs! So enjoy, guilt-free! Bon Appétit! Outside of heat, transfer to a bowl and stir in the Vanilla extract. At this stage, you could refrigerate the mixture until you are ready to bake the macaroons. If you don't have coconut flour, you could use all purpose flour. I found that it was easier (and less messy) to shape the macaroons if the dough had been cooled in the fridge for a while. You could dip the bottom in chocolate for a fancier/richer version. I love to make Macaroons with kids - My daughter especially loves when we mix melted chocolate into the mixture before baking! I thought I perfected the above recipe but yours looks glorious! Glad to not see condensed milk which is in so many recipes for these light delights and ruins a macaroon, I think.